Run, jump, die, repeat... with a friend. It's been several years since we've seen anything major happen in the N universe. The minimalist take on the classic arcade platformer by Metanet Software started as a PC downloadable game then spawned a copy of itself called N+ for XBLA, PSP and Nintendo DS. Now the studio is working on a proper sequel, N++, but has released a nice little update for N to keep us screaming in frustration. Ladies and gentlemen, N v2.0 has arrived. And it has co-op! Here's now this whole N v2.0 business works. 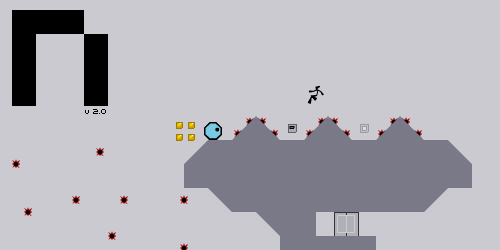 You are a ninja running around in a stark-looking world of walls, floors, platforms, coins, and things that cause instant death. Now just run, jump, and wall jump through around 500 levels, collecting as many coins as you can and making it to the exit before the timer ticks out. If that sounds easy, you probably haven't been paying attention to N all these years. It's tough. So tough that Metanet says they put the "N" in FUN while we supply the "FU". N v2.0 comes with brand new stages, a level editor, high scores, "FUN-lockables", an integrated level sharing system, and something else we thought was important. What was it? Oh yeah, co-frickin'-op. Or just co-op. Switching to two player mode allows you and a local friend to share a keyboard and get through the literal minefields together. Nothing builds camaraderie like pretending to be coin ninjas together. You can play N v2.0 online or download it to your electronic desktop computer system. Either way, it's free!